The Powertruss PT Brace is a strong, yet light-weight narrow wall bracing frame that provides large bracing values in small spaces. The Powertruss PT Brace fits between the studs within the building frame and bolts directly to the slab (with the bottom plate removed). The top member of the Powertruss PT Brace is positioned under the top plate of the building frame. For more information, see our installation guide. It is manufactured in standard frame widths of 250mm, 300mm, 350mm, 400mm, 450mm, 500mm, 550mm, and 600mm to suit returns and nib walls; especially at either side of large window and door openings. The Powertruss PT Brace is manufactured to suit building frame heights up to 3600mm. Non-standard heights are no problem. We manufacture to suit your height requirements. Powertruss can also be used on raised floor applications when fastened directly to a PFC or timber bearer (to the direction of the project engineer). 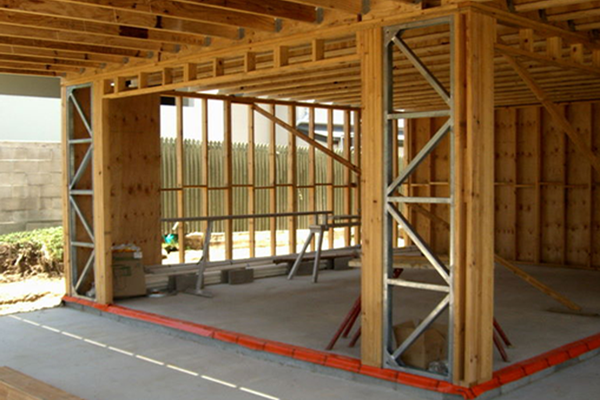 Retrofit application of Powertruss frames are becoming more popular in extensions to existing homes, as well as removal homes or house raising situations to allow larger living areas. Bracing for narrow or small lot homes at garage doors, entries and alfresco areas is made easy by use of the Powertruss Brace.